The Gulf of Mexico is the ninth largest body of water in the world. It covers about 600,000 square miles with a total coastline measuring about 3,540 miles. It is an ocean basin which is partially landlocked. It was created when continental plates collided in the late Triassic Period approximately 300 million years ago. The explorer Amerigo Vespucci was the first ever European to explore the Gulf of Mexico in 1497. The Gulf Stream which is one of the strongest ocean currents in the world originates in the warm waters of the Gulf of Mexico. There are 29 marine mammal species that can be found here including bottlenose dolphins, humpback whales, sperm whales. The Gulf of Mexico is incredibly bio diverse. Till now, 15,419 species have been found in this ecosystem. There are only two breeding grounds for Atlantic bluefin tuna in the world and the Gulf is one of them. A total of thirty three major rivers drain into the Gulf and the Mississippi River is the largest of them all. It is bordered to the north, northwest, and northeast by the United States Gulf Coast, by Mexico to its south and southwest, and Cuba to its southeast. There are a total of 207 different estuaries that empty into the Gulf and 31 of them are major estuarine watersheds. Almost half of the Gulf basin is in shallow waters over continental shelves. 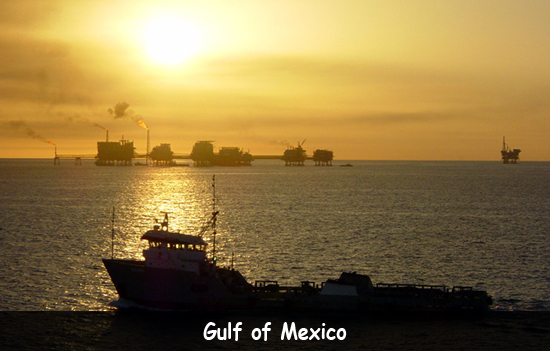 The average depth of the Gulf of Mexico is around 5,298 feet. Its deepest point is known as Sigsbee Deep and has an estimated depth of about 14,383 feet. About 28% of the total U.S. wetland is represented by the coastal wetland of the Gulf. Declan, Tobin. " Amazing Facts for Kids about Gulf of Mexico ." Easy Science for Kids, Apr 2019. Web. 23 Apr 2019. < https://easyscienceforkids.com/gulf-of-mexico/ >.